Five years ago we purchased a rolling toolchest to house our growing collection of tools. A few years later, we went with a more industrial unit because we needed a bigger one. When the interns wanted their own tool cabinet, we looked around to see what would be appropriate. What we found (on Craigslist, of course) was a rolling Craftsman Project Center which is a hybrid between a tool cabinet and a workbench…perfect! 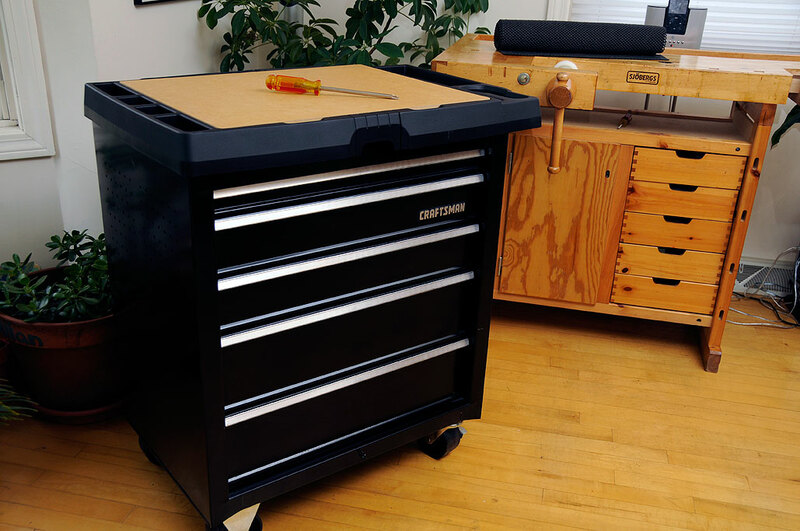 The Craftsman Project Center is a five-drawer rolling cart with a reversible medium-density fiberboard (MDF) work surface. Underneath the removable work surface are moulded wells for tools, screws, and misc bits. Next to the work surface is a holster for an electric drill. The cart also has a powerstrip on the side to make it easier to use with power tools. Below the work surface are five drawers of varying depths. The drawers are on full-extension slides. The slides action felt a little rough at first, but a bit of WD-40 took care of it. The slides are definitely not as heavy-duty as the stainless SteelGlide unit, but they should hold up to what we intend to use it. As we plan on rolling this cart around, there are a few upgrades which would help make it more tools-friendly. The first upgrade is installing drawer liners. These are rubber mats with a very “grippy” surface. They are great for preventing tools from sliding around, banging against each other, or otherwise clanging and denting the drawer bottoms. They typically come in a roll and may be be cut-to-fit. 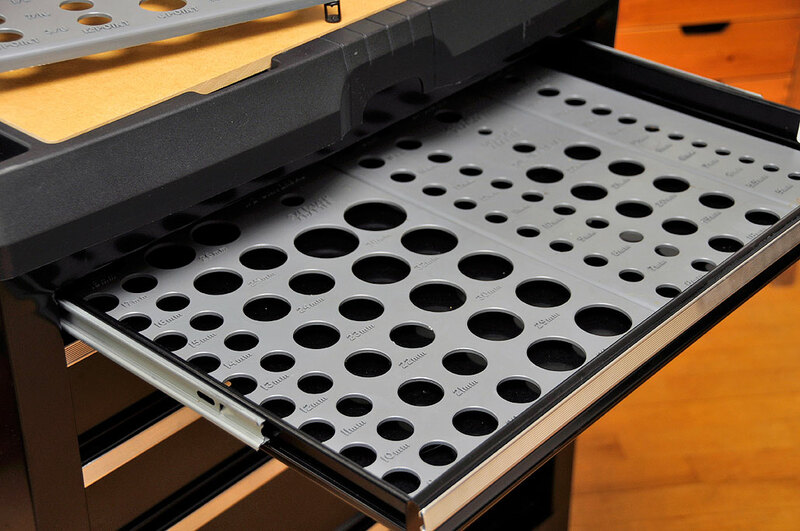 While the drawer liners are great for keeping tools from shifting around, they won’t do much to keep sockets from bouncing about when the cart is on the move. If you have a few dozen ones, it would be a mess if they got all jumbled up. These Craftsman socket trays are made to fit the drawers. They will keep all those socket pieces in place, easy to find, and readily accessible. Overall the unit is both structurally strong and functionally versatile. The gauge of the steel used is lighter than the SteelGlide and may be easier to dent up over time. Still, we think it will be a good addition to our workshop. The interns will put this Craftsman Project Center into service and follow up with an update once they get some mileage out of the cart. Look for it in 2012.